British brand Atkinsons will launch a new trio in their Legendary Collection of fragrances resurrected from their archives. Amber Empire, The Excelsior Bouquet and Love in Idleness will join previous launches The British Bouquet, The Odd Fellow's Bouquet, Fashion Decree, 24 Old Bond Street and The Nuptial Bouquet. Amber Empire ~ an oriental developed by perfumer Maurice Roucel and based on a 1927 scent. The notes include oolong tea, sandalwood, myrrh, incense and vanilla. The Excelsior Bouquet ~ a fougère developed by perfumer Benoist Lapouza and based on a 1919 scent. With notes of flint, sage, spice, leather and vetiver. Love in Idleness ~ a chypre developed by perfumer Fabrice Pellegrin and based on a 1922 scent. Featuring notes of violet flowers and leaves, raspberry, iris, heliotrope, tree moss and patchouli. 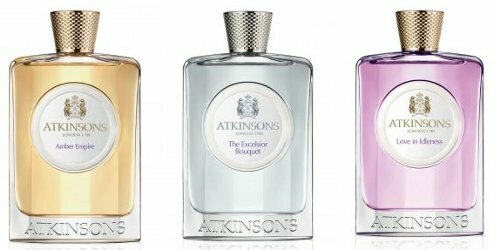 Atkinsons Amber Empire, The Excelsior Bouquet and Love in Idleness will be available in 100 ml Eau de Toilette. Haven’t tried this line. The amber one sounds good. They’re not widely distributed here…doubt I will see these. LOL — don’t we all!